P21 antibody LS-C59514 is an unconjugated mouse monoclonal antibody to human p21 (CDKN1A / WAF1). Validated for ELISA, IHC and WB. Cited in 5 publications. Recombinant human p21 fusion protein. 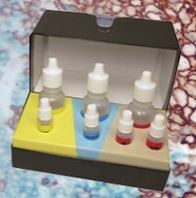 This antibody is suitable for immunohistochemistry, ELISA and immunoblotting. 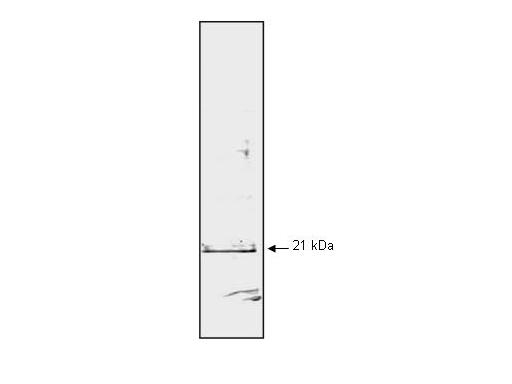 The antibody detects a 21 kD band corresponding to the p21 protein. MCF7 cells or UV treated fibroblasts are suggested as a positive control for immunoblotting and immunohistochemistry. Methanol/acetone fixed tissue is reactive for immunohistochemistry. The antibody also reacts with breast carcinoma on frozen sections (methanol/acetone fixation) and on paraffin sections (formalin fixation and microwave treatment prior to staining). In ELISA this monoclonal antibody is useful either as a capture antibody (attached to the solid phase) or for detection of p21 protein. This antibody immunoprecipitates monomeric p21 WAF1 and not p21 complexes with other proteins. High level expression of p21 WAF1 requires induction of wild-type p53 expression (e. g. via exposure to DNA damaging agents). 0.02 M potassium phosphate, 0.5 M sodium chloride, pH 7.2, 0.01% sodium azide. Anti-Human p21WAF1 Monoclonal Antibody - Western Blot. Mab anti-Human p21WAF1 antibody (clone WA-1) is shown to detect human p21 by western blot. Detection occurs after 10 ug of a HeLa whole cell lysate is loaded per lane. The blot was incubated with a 1:1000 dilution of Mab anti-Human p21WAF1at room temperature for 30 min followed by detection using IRDye800 labeled Goat-a-Mouse IgG [H&L] ( diluted 1:5000. A single band corresponding to human p21WAF1 is detected at ~21 kD when compared with known molecular weight standards (not shown). The antibody may be used to detect endogenous human p21WAF1. IRDye800 fluorescence image was captured using the Odyssey Infrared Imaging System developed by LI-COR. IRDye is a trademark of LI-COR, Inc. Other detection systems will yield similar results.